Some suggestions for a Work, play, sleep’ routine…. by Lara, you will get to know Lara more over the coming months, Lara is a new Mum that wants to share her tips with you on what she has found helpful, if they can help great, always good to know what works for others….. Although your little bundle is the most precious thing in the world to you, there will come a time when you want to work and they want to play. Some babies fall right into the idealised ‘eat, play, sleep’ pattern that mums are supposed to encourage. Giving you clear nap times when you can do the housework, clean, cook or actually work from home. Some babies however will not, or may want really long play times. This article outlines a way to play with bub while you work! At just over 2 months old my bub is in a loose 3 hourly ‘eat, play, sleep’ routine but if I want to get a few solid hours of work done then this is how I play with her while I work. If you intend to work on the computer and have a laptop then it is easy to set up the play area so you work at bub’s level and within visual range. I have bub on her play mat with an assortment of toys to one side and the window on the other. The face cloth is because she just fed. But I don’t leave her, even for a minute, with the bib or face cloth as she may get them over her face. Indirect sunlight is very important for babies, especially when newborn to prevent jaundice and when older to help with eye development. Sunlight exposure has also been shown to help them sleep at night. Sit on the side with the toys, on a comfy cushion, on the floor. You can talk to baby while you work and occasionally pick up a toy or rattle to entertain her. Be close enough to touch baby to let them know you are close by if they look out the window and cry because they think they are alone. You can keep baby entertained for an hour or so while you work. Talking to baby is really important for their development, so tell her what you are doing as you work. Visual stimulation is also important, and the best toy your baby can learn from is you! Your facial expressions, hand movements, touching her and talking while you do so is much more educational than the best researched baby toys. Playing music while you work may also help keep baby entertained, happy and learning. It may get boring for you, but babies lean from repetition, so repeat the same songs daily. Make a baby playlist with a selection of louder, fun songs at the beginning and quieter ones at the end to help baby calm down for nap time. Once baby is all tuckered out and showing one or two of the signs of sleepiness, transfer her to where she sleeps for nap time. By setting up your work area in babies nursery you don’t have far to go to pop her in her cot. You can carry on working close by if she needs settling or you can move somewhere more comfortable. This way you can work through play time and nap time. You may want to work on the computer or a note pad during play time, then do housework during nap time when baby doesn’t need you close by. You may even find that a well set up play area can keep baby entertained all by themselves and you can have it set up close to where you are so you can keep an eye on her. 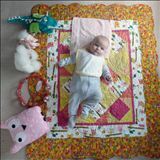 Setting up on the floor is the best as baby actually benefits most from being on a flat, hard surface to learn her motor skills. And you can easily flip baby over for some tummy time! Although this may work a lot of the time, it will not always work. Don’t be frustrated with baby if she is grumpy one day and just wants to be cuddled. When this happens you can play a video (for you) and/or just cuddle until her next cycle and then try again. Hope this helps, good luck with your ‘eat, play, sleep’, and don’t forget to get some of each yourself!